I have a love hate relationship with my computer. Actually, not so much my hardworking lovely computer...it's more with my photo editing software. I love it...until it doesn't want to work. Then I hate it more passionately than my hate for spiders in my house. You know, those gangly gross guys that SOMEHOW forever find ways to make it into your home even though you try and try everything in your power to keep them out?! And while we're on this topic, how DO they get in?? And why do they always decide to show themselves at the worst possible time?? I guess there's really no "good time", but I assure you crazy gross spider that while I'm resting in bed about to turn all lights off and fall asleep- this is NOT a good time to come crawling up my bedroom wall. You are gross, scary looking and with my bedside table's light shining on you JUST PERFECTLY- you and your cast shadow make me want to barf all over my nice new clean sheets. Blech. That hate I have for them? It's kind of like the hate I can have for my photo editing stuff when it doesn't want to work properly. Maybe it's just getting old? Does that make sense? I mean...I should be able to listen to Pandora while editing photos. Right? This shouldn't cause my program to crash over and over and worse than when I load up on sugary candy goodness and try to pretend I'm a 13 year old. Right? Ugh. So needless to say blogging has been harder to do lately. Who likes to blog in silence? Pffft. I will win this fight, computer. I WILL. Here's some good news- it's been so warm here lately. I know some people might want to punch me for saying this- but we've actually enjoyed the sudden heat wave. Like I've said before, I'm usually in pants and long sleeve shirts because of where we specifically live, so any chance to sport a skirt or dress is a good day! This last weekend our town's thermometer thinggy actually read 79 and 80! Happy dance. I like to have conversations about this stuff with my friend in Arizona- she'll laugh at me and say how it finally "cooled down" to that temperature around 8 or 9 that night. Wow. Ah beach cities, thank you for your lovely beachie weather! Any who, when it is actually warmer in our home, I do get sort of allergic to the oven. It's like I just can't get close to it without wanting to throw a fit and run screaming away. Dramatic much? Sure, why not. It's what I do best. I like to make sure you guys really truly honestly can see and feel what I'm talking about, haha. So lets all imagine our home, which has giant windows facing the setting sun come evening time- being lit up (beautifully I might add) but very very warmly. It's dinner time, we need food- there's really no way our already-feeling-like-an-oven-home is going to have an actual and very real oven preheating. So I usually turn to quick cooking foods like salads. Insert this lovely guy. Using fresh herbs from our little garden, organic veggies, and a homemade (simple) vinaigrette...this was dinner. This was a simple, quick dinner. This was a good dinner. Wash and dry all fruits and veggies. 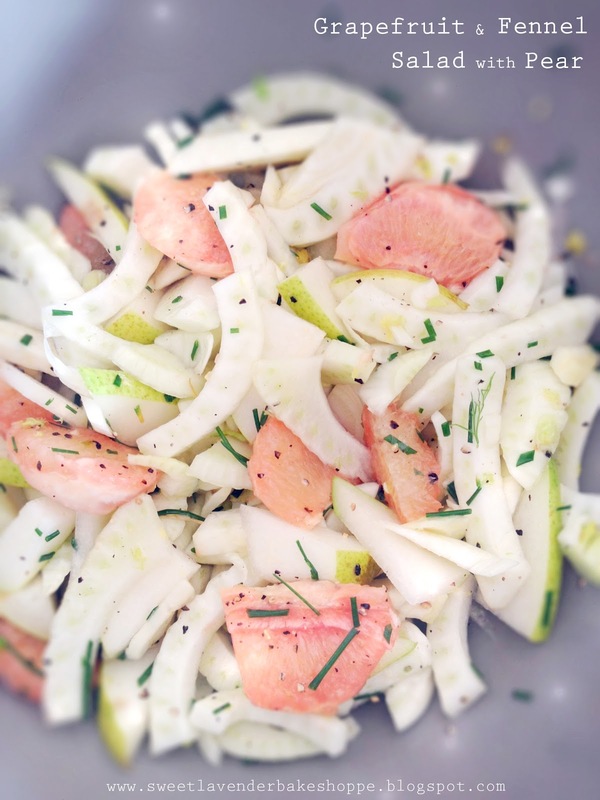 Thinly slice your fennel and pear, add to a large bowl. Next, cut off all peel and pith (the white stuff) from your grapefruit, and cut into supremes (click here for a how to). If you don't feel like you can supreme it, feel free to cut into wedges after cutting away the peel and pith. Add wedges and any juice to bowl with fennel and pear. Next chop (or cut with scissors) your fresh chives and add to bowl. In a separate bowl, whisk together olive oil, white balsamic vinegar, salt and pepper and drizzle over your fennel salad. Toss gently. **This is also delicious with fresh organic baby spinach leaves added. **This salad can be made and dressed 30 minutes ahead of time, but I wouldn't suggest any longer. Need more time? Prepare salad up to the dressing part, make dressing in a separate bowl, and store for 1-2 hours in fridge. Come time to serve, just re-mix vinaigrette, toss into salad, and serve! yikes! sorry about your photo-editing. it just knows when the most inconvenient times to crash are & chooses 'em. it really puts me in the pits of despair too. but hey, at least this photo looks spectacular! and as for the recipe...well, it's getting pinned NOW. xo. Everything about this salad is very appealing to me. I love fennel, love grapefruit (plus haven't had it in quite some time, so I'm putting it on my grocery list! ), and enjoy salads that are different from my typical green go-to salad. This is great for any picnic, bbq or relaxing summer evening! This looks amazing! :) Yummy! Looks refreshing & perfect for summer. I think you might have finally convinced me to get over my fear of fennel and start using it!! Oh and I've got the same allergy to the oven on hot days... that is the worst thing you can do in our house - start up the oven! Woohoo! Fennel is so good for you too! You actually inspired me to post this! Remember? You encouraged me by saying you'd love to have this specific recipe...I wasn't going to post it, but glad I did!